Can আপনি name the cartoon where Wile E. Coyote finally catches the Road Runner? As usual, for Wile E. Coyote, we see him chasing the Road Runner down the road; napkin, ছুরি and fork ready. Everything froze as if being stopped দ্বারা a pause button, and their labels appeared below them; "Coyote - Pursuitus Roadrunnerus" and "Road Runner - High Speed Hotrodicus". Then everything unfroze and the chase recommenced for a few seconds. I প্রণয় these people I admire greatly in meep meep roadrunner special ... হাঃ হাঃ হাঃ ...!!! 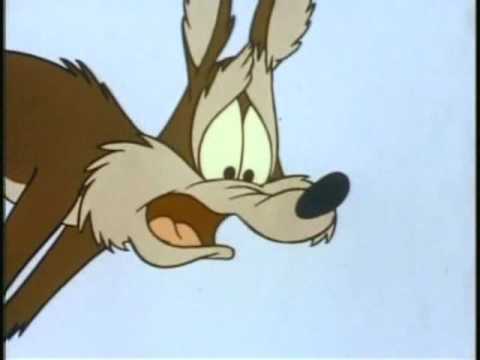 a pop quiz question যুক্ত হয়ে ছিল: What was the first cartoon in which Wile E. Coyote spoke? 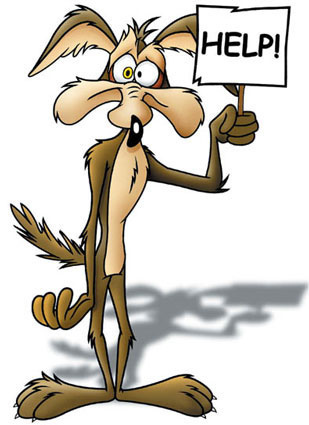 a question যুক্ত হয়ে ছিল: Can you name the cartoon where Wile E. Coyote finally catches the Road Runner? Coyote was voiced দ্বারা whom till 1952? Coyote was silent till 1952.